Additional Info: Multiple giant cells are present. An extensive panel of immunostains was performed, including adenovirus, measles, herpes, varicella, and others. 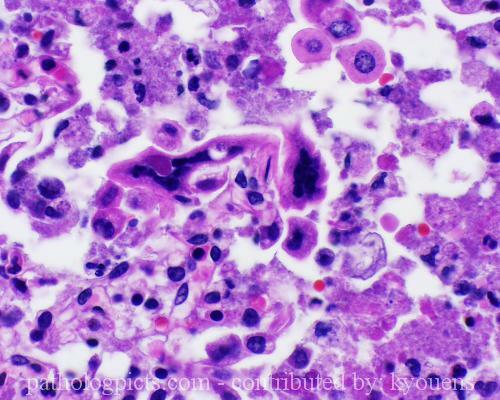 The multinucleated cells stained strongly for RSV. Very good image. I would have this question: Should we even bother to try to identify the agent ? In this case there were a lot of immunos being done which is costly for the patient. I would first check if virology/microbiology has been submitted by the clinicians ( I assume that this is baby with RSV) and if they have than I would not bother with immuno. Virology/micro is a standard of care if we have kids, AIDS or other immuno compromised patients and no clinical/Ro suspicion for carcinoma. You raise an excellent point. This patient was already known to have RSV. Unfortunately, this was an autopsy case, as this person died from the infection. They were not charged for the stain--it was done mostly for academic interest.